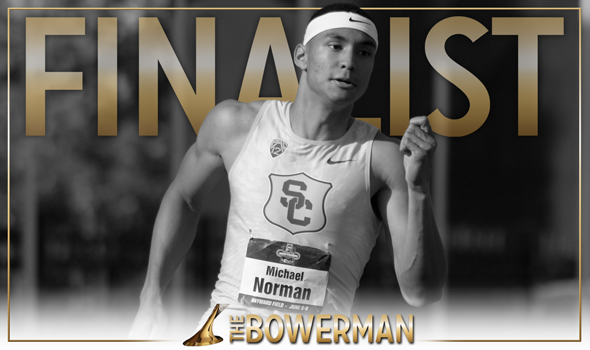 NEW ORLEANS – Men’s finalists for The Bowerman, collegiate track & field’s highest honor, were announced Thursday by the U.S. Track & Field and Cross Country Coaches Association (USTFCCCA). 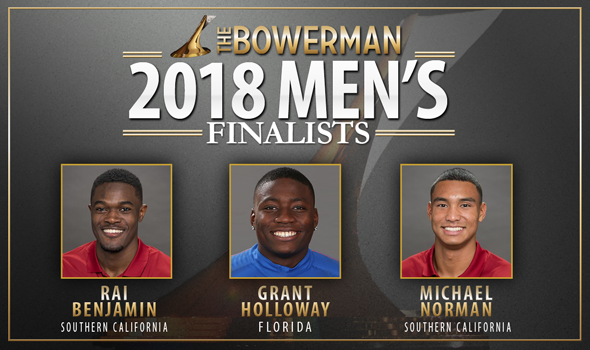 Florida’s Grant Holloway and the Southern California duo of Rai Benjamin and Michael Norman were chosen by The Bowerman Advisory Board as the most outstanding male athletes during the entire 2018 collegiate track & field campaign. 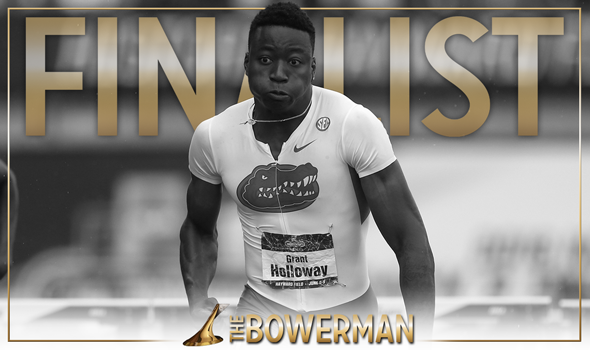 Holloway is the fourth Gator to be a finalist (first since 2015), while Benjamin and Norman are the fourth set of male teammates to be finalists in the 10-year history of The Bowerman. The Bowerman Advisory Board is an 11-person panel of track & field experts from around the nation who selected the finalists based on performances recorded during the 2018 indoor and outdoor track & field seasons. Only performances from December 1, 2017 through the conclusion of the 2018 NCAA Division I Outdoor Track & Field Championships in Eugene, Oregon, were eligible for consideration. Benjamin, a junior from Mount Vernon, New York, left his mark on the collegiate record book – and on the world landscape – in both the 400 hurdles and as part of the Trojans’ 4×400 relay team. 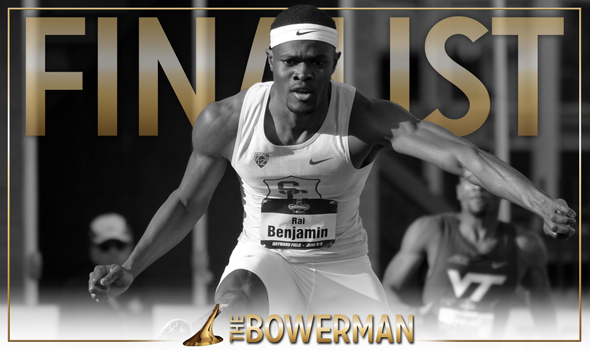 It was in the final of the 400 hurdles at the NCAA Outdoor Championships where Benjamin clocked a time of 47.02, which broke a 13-year-old collegiate record and tied him as the second fastest performer in world history with Edwin Moses. Later that day, Benjamin split 43.6h on the second leg of Southern California’s record-setting 4×400 relay for the fastest second leg split in meet history. During the indoor season, Benjamin twice ran sub-45 second splits as Southern California broke and then bettered the collegiate indoor record in the 4×400, the latter of which to an all-time world best of 3:00.77. Benjamin also finished third in the 200 at the NCAA Indoor Championships. Holloway, a sophomore from Chesapeake, Virginia, continues to be the Swiss Army knife of collegiate track & field athletes. He competed in seven finals in three different disciplines between the two NCAA Championships: 60 hurdles, 110 hurdles, indoor/outdoor long jump, 4×100 relay and the indoor/outdoor 4×400 relay. Holloway swept the NCAA titles in the short hurdles and established five total all-time marks in those events. He broke the collegiate indoor record in the 60 hurdles with his time of 7.42 at the Tiger Paw Invitational and notched the second fastest time in collegiate outdoor history in the 110 hurdles (13.15) at the SEC Championships, among others. Holloway finished runner-up in the NCAA long jump indoors and ninth in the event outdoors. The sophomore became the only man in world history to go sub-13.20 in the 110 hurdles and long jump at least 8.10m (26-7) outdoors – and did so within the span of 28 hours. That came after he was just the second man to go sub-7.50 and farther than 8.00m (26-3) indoors. As a member of those aforementioned relay teams, Holloway’s Gators finished third twice (indoor 4×400, outdoor 4×100) and fourth once (outdoor 4×400). Norman, a sophomore from Murrieta, California, isn’t just the fastest man in collegiate history over 400 meters: He is the fastest – or is among the fastest – in world history. During the indoor season, Norman broke the world record, which was also the collegiate record, in the 400 at the NCAA Championships with his time of 44.52. That came less than an hour before Norman anchored Southern California’s 4×400 relay team to an all-time world best mark of 3:00.77 in 44.52. Outdoors, Norman saved his best for the postseason. Norman whet appetites with his 4×400 split of 43.06 at the NCAA West Preliminary Round, which is the second fastest carry in world history. Norman then unified the 400-meter records when he turned one lap in 43.61 at Historic Hayward Field and became the sixth fastest performer in world history. Norman finished 2018 with an unblemished record as he went 9-0 between six 400-meter finals and three 200-meter finals indoors and outdoors. Fan voting for The Bowerman begins today and runs through Thursday, June 28. Paper voting for past winners, The Bowerman Advisory Board and select media personnel, statisticians and collegiate administrators concludes July 20. Benjamin, Holloway and Norman will be feted on Thursday, December 20, at the annual USTFCCCA Convention in San Antonio at the JW Marriott San Antonio Hill Country Resort & Spa. One of these three incredible athletes will take home the highest individual honor in collegiate track & field that same night following The Bowerman Presentation. The online fan vote has closed. Stay tuned for updates!